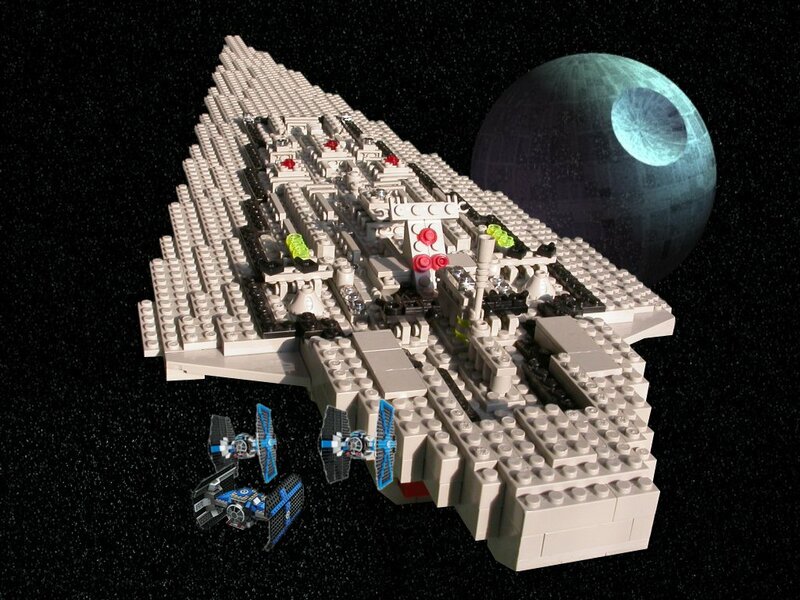 This is my model of Darth Vader's flag-ship Executor from The Empire Strikes Back and Return of the Jedi, colloquially known as a Super Star Destroyer. 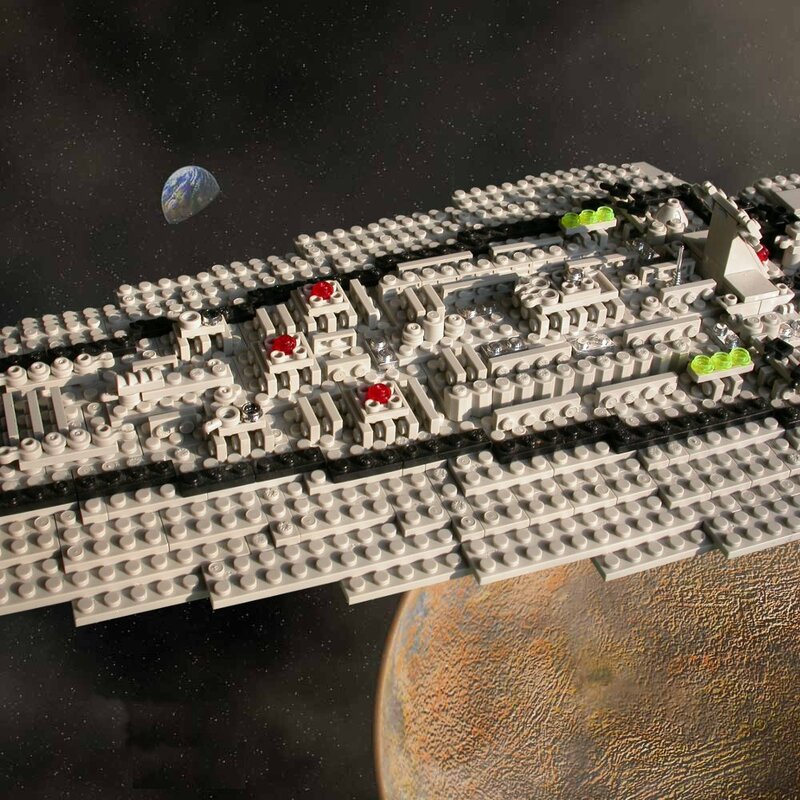 It looks like Lego, but it's actually a much cheaper Lego knock-off made by Mega Bloks. The Mega Bloks company makes all sorts of rubbish, but their pirate Lego is actually not bad at all: not as good as the real thing in subtle ways, and the selection of pieces is nowhere near as rich, but it does at least stick together, unlike the pirate Lego I used to have as a child. I used the pieces from two Mega Bloks ``Probuilder'' kits: the excellent P-51 Mustang and the sadly discontinued Kitty Hawk aircraft carrier, which seems to have been replaced by the USS Nimitz. That gives about 2400 pieces, of which I think I used about half. 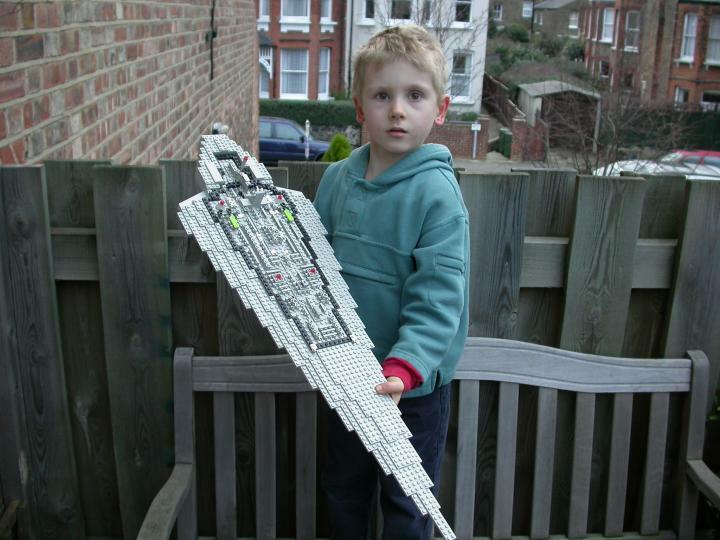 The model is exactly 100 studs long, which comes in at 85cm. 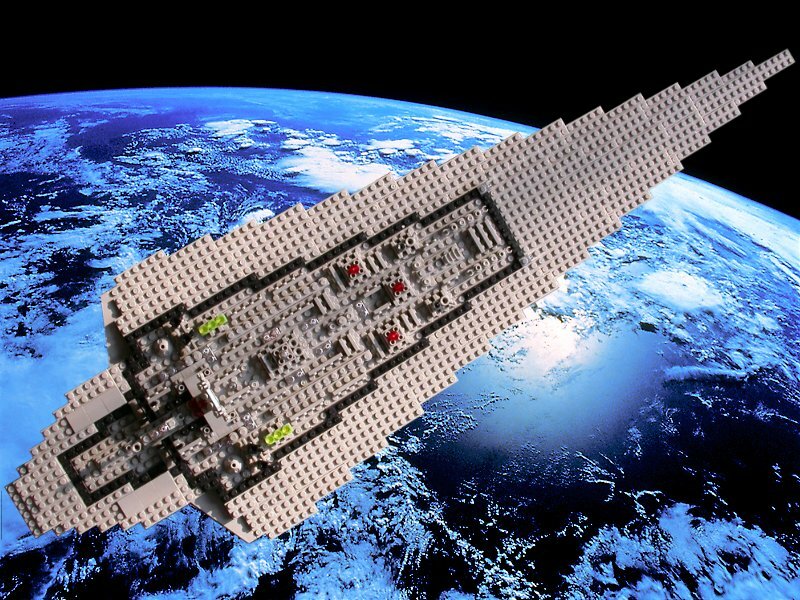 Assuming that a real SSD is 17.6km long, my model is in 20700:1 scale. But SSD size is controversial, so this scale must be taken with a pinch of salt. Top view. 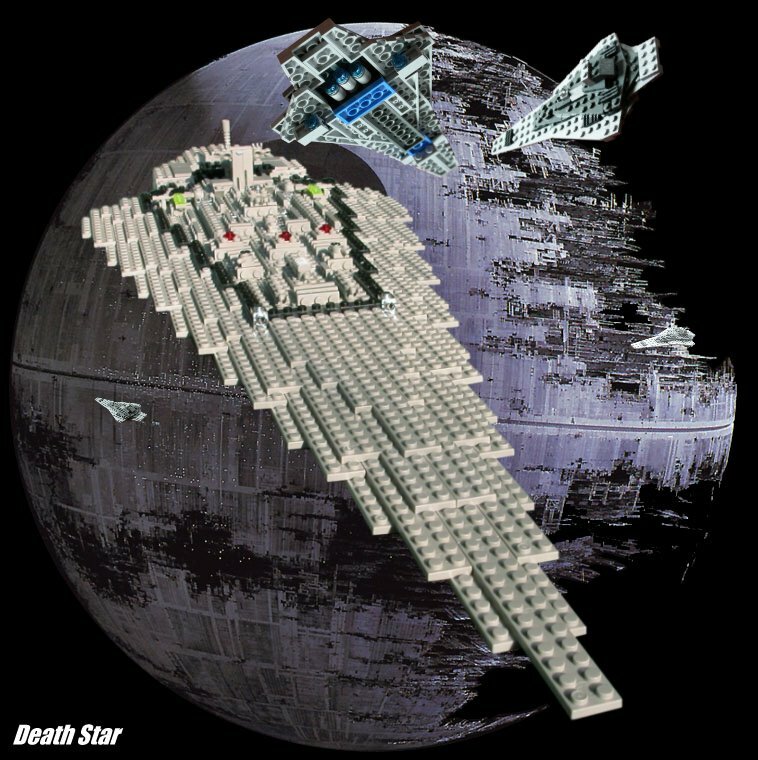 The black outline marks the ``cortex'' or ``city'' of the Super Star Destroyer. If I'd had a selection of grey shades, as real Lego has, I'd have used a darker grey for the cortex area, but Mega Bloks doesn't afford that luxury. I modelled the proportions on the photos of the model at www.starwarsmodels.com/Ssd.html, which in retrospect was a mistake: there are several things wrong with this, most notably that the tail-fan is too short compared with the rest of the ship. Front view. 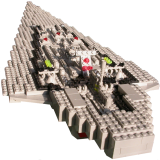 I'm fond of this view - I think it really captures the Super Star Destroyerness of the model. Unfortunately, it also emphasises the steps along the diagonal sides. That's unavoidable: my selection of pieces only included two (two!) diagonal pieces, which I used for the fillets behind the wings - see the next photo. Back view. There are my only two diagonal pieces, placed where I thought they could have the greatest effect. That's a glimpse of the leftmost of three main engines just below the tail-fan. The fan should be much less thick from top to bottom, really forming just a thinnish cover above the engine mountings. Detail of 'cortex' or 'city'. The general shape is pretty much right, but the specifics of the various buildings are all made up. I was aiming for the right impression rather than trying -- probably futilely -- to capture the individual features of the real SSD. The bridge is rather too large in proportion, but seems to work. View of engines from beneath. The Executor has thirteen engines in all: a bank of three engines in the middle; ahead of and outside these, two further pairs of engines; and ahead of and outside those, two triples of steering engines. Due to limitations of space and material, I have had to bring these closer together than I would have liked, and that still leaves the steering engines further forward on the wings than they should be. Danny. The eldest of my three sons - he was six when this was taken. it gives more sense of the size of the model than any other photo I have of it. At the time of writing, the SSD is pretty much his favourite toy. He moves it around veeery veeery slooowly, to emphasise its great size. There's my very own mini-SSD at www.miketaylor.org.uk/lego/mini-ssd which is made from the pieces in the official mini-Star Destroyer kit. Small, but neat. It appears, uncredited, in some of the large photos linked from this page. 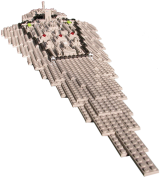 Stephen Rowley has made a very creditable attempt at an SSD at home.mira.net/~satadaca/lego.htm#Super_Star_Destroyer. 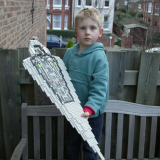 His model is 53 studs long (45cm or 18in), which makes it 33200:1 scale. 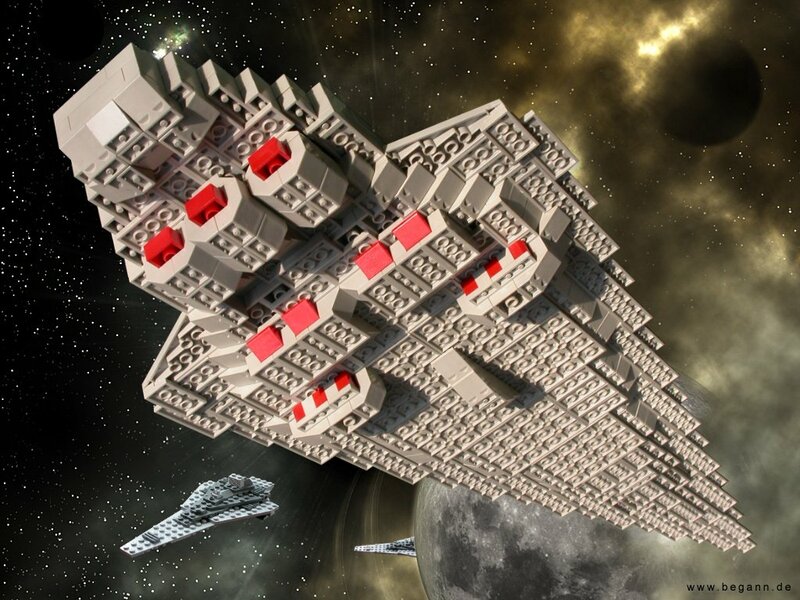 But the daddy of them all, the undisputed champion, is Lasse Deleuran's astonishing Executor, which is comprehensively modelled at www.mocpages.com/moc.php/1549. It's not just that his model is 158cm long (186 studs or 63in, slightly taller than my wife): it's the truly absurd level of detail and authenticity that makes this the king of them all: not just the best Lego SSD I've seen, but perhaps the best Lego model of any kind.